The 39.62 metre motor yacht Destiny, jointly listed for sale by Alex Krykanyuk at Fraser Yachts and Yannis Mitsopoulos at Ocean Independence, has had a further €400,000 price reduction. Built in aluminium by US yard Broward Marine to ABS class, she was delivered in 1992 with a refit in 2016 that saw an overhaul of her engines, generators and gearboxes along with a complete interior upgrade. Accommodation is for 10 guests in five cabins including a main-deck master suite, three doubles and a twin below, all with entertainment centres and en-suite bathroom facilities. In addition, there are quarters for seven crew. The saloon is divided into three separate areas, with a lounge aft offering two L-shaped settees facing each other plus occasional chairs, while further forward is a games table, more chairs and an entertainment centre including a 74-inch curved television screen. Further forward still is a formal dining area with seating for 10 guests and custom storage cabinets for glassware, china and silver. The aft deck of this yacht for sale has al fresco dining around an oval table surrounded by upholstered armchairs while upstairs, forward of the wheelhouse, is a large circular sunbathing area. Aft on the boat deck is the tender storage area which, when the tenders are launched, offers a large entertainment space that can be used for a variety of functions and is equipped with full dining and bar facilities. Triple 1,550hp Caterpillar diesel engines give her a cruising speed of 12 knots and a range of 4,500 nautical miles at 10 knots. 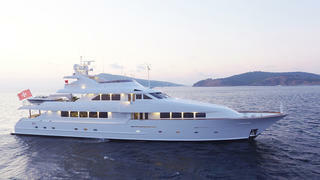 Lying in Istanbul, Turkey, Destiny is now asking €3.9 million.